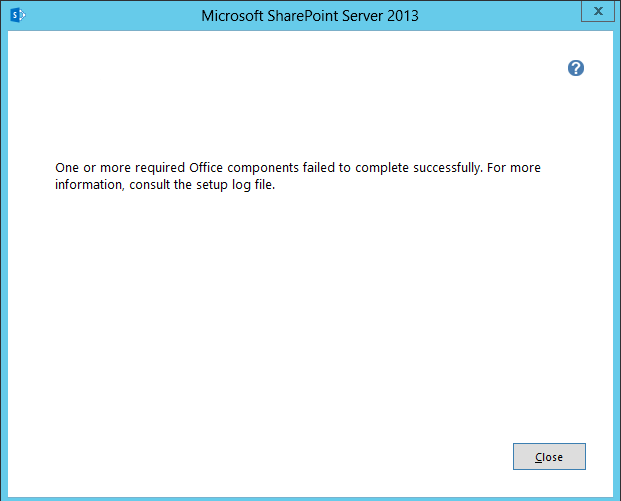 Uninstall SharePoint 2013 - One or more required office component failed to complete successfully. While uninstalling SharePoint Server 2013, you may get below error message. "One or more required office component failed to complete successfully. For more information, consult the setup log file." as shown in below screenshot. 1. Go to your Database Server. 2. Go to Services section:- Go to Run (Windows + R) and type "services.msc". Again go to Control Panel and uninstall SharePoint 2013, you will not get this error this time. In case, if you reinstall SharePoint server, do not forget to restart all those services. 1. Users from internal organization can send emails to this Distribution Group. 2. External Users ONLY from partner organization domain can send emails to this Distribution Group. Distribution Groups in Exchange Online provides a functionality to restrict External Users to send emails. But here, in this case, we need to allow users from one External Domain (let's say domain is demowork.xyz) to send emails to Distribution Group. Domain based sender filtering is NOT directly available when we create the Distribution Group, but we can achieve this requirements by creating a Transportation Rule in Exchange Online. 1. Login to Exchange Control Panel (ECP). 2. Navigate to "Recipients" -> "Groups". 3. Click "+" icon and select "Distribution Group". Display Name: Desired Group Name (We will name this as "Helpdesk" in this example). Alias: Desired Group Alias Name (We will keep this as "Helpdesk" in this example). Add Owners and Members of the group as needed. Select Group Membership options as needed. We will select "Closed" for both the options - (1) Choose whether owner approval is required to join the group. (2) Choose whether the group is open to leave. Select this Distribution Group and Click Edit icon. Go to "Delivery Management" in newly opened window. Select "Senders inside and outside of my organization" option and click "Save". 7. Now, we have a group created that accepts emails for senders from inside and outside organization (any sender from any domain). Now, We have to create a Transportation Rule to restrict this Distribution Group to receive emails only from senders inside organization and from specific partner domain (e.g. demowork.xyz). 1. Go to Exchange Control Panel -> Mail Flow -> Rules. 2. Click "+" icon and select "Create a new rule". 3. Click "More Options" at bottom of the newly opened window. Apply this rule if -> select "The message..." -> "To or Cc box contains this person". Select newly created DL and click OK. (In this example, we will select "Helpdesk"). Do the following -> "Block the message..." -> "Reject the message and include an explanation". Specify the desired explanation like "This email address is only for specific people. You are not allowed to send emails to this address" and click OK.
Click "add exception" under "except if" section. Select "The sender..." -> "domain is"
Add internal organization domain (in this example, binaryrepublik.com) and partner domain (in this example, demowork.xyz) and click OK. Basically, here we need to define domains of allowed senders. The Distribution Group & Transportation Rule is configured. This way, using Transportation Rule, we can allow a Distribution Group in Exchange Online to receive emails only from senders of specific domain(s).